Greetings again from the darkness. This is the third in a series of unparalleled looks at war from the front line courtesy of co-directors Christian Tureaud and David Salzberg. 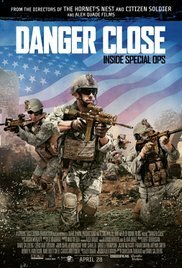 Their 2014 documentary The Hornet’s Nest followed war correspondent Mike Boettcher and his son as they covered the most violent era of the Afghanistan War, and 2015’s Citizen Soldier went inner circle with the Army National Guard’s 45th Infantry Combat team in Afghanistan. This time the focus is on the work of war correspondent Alex Quade, a female reporter (yes, her gender is worth noting) who documented missions carried out by Special Forces teams. Ms. Quade’s interviews with Wendy R Anderson provide structure to the film and a chance for viewers to catch their breath in between combat videos. The interviews allow us to get a better feel for Ms. Quade’s personality and motivation. She states that after being around soldiers in such stressful and life-threatening times, she believes “I have to tell their stories”. These are stories we aren’t usually privy to on network news reports. These situations go beyond dangerous and require courage most of us can’t imagine. There is some incredible early footage, much shot with night vision, which chronicles a large scale air assault ending in tragedy. The helicopters are being fired upon from ground-based weapons, and one is shot down. We then see how fast the rescue and recovery mission is implemented and how there is no hesitation in going in. Ms. Quade makes this the personal story for one soldier – Rob Pirelli. She interviews his fellow soldiers, and even visits with Rob’s parents at their home. The film begins in 2007 and goes into 2008 where she tracks the progress of Combat Outpost Pirelli – a home for a Special Forces team. This is outstanding and eye-opening journalism, and forces viewers to confront the atrocities and always present danger of war. There are times during the interviews where Alex Quade comes off a bit arrogant, but we are reminded of a quote that at times has been attributed to Muhammad Ali, Bear Bryant, and Dizzy Dean … “It ain’t bragging if …” Ms. Quade deserves much respect for her tenacity and bravery for doing what’s necessary to tell these stories. This entry was posted on Thursday, April 27th, 2017 at 9:58 pm and is filed under Documentary, War. You can follow any responses to this entry through the RSS 2.0 feed. You can leave a response, or trackback from your own site.